Three months ago, Governor Andrew Cuomo announced a ban on high-volume hydraulic fracturing in the state of New York. So – at least for now - contamination from active drilling is off the table. But there are other ways that hydrofracking puts New York’s water resources at risk. Steve Penningroth, director of the Community Science Institute recently spoke about how shale gas waste disposal and infrastructure development threaten the state’s water resources despite the federal Clean Water Act and the state-wide frack ban. State regulations that address wastewater treatment plants, factories, landfills, and even concentrated animal feeding operations (CAFOs) allow a certain amount of pollution. That’s because the SPDES permits (State Pollution Discharge Elimination System) specify the source and quantities of pollutants that operations can “legally discharge” into streams, rivers, and lakes. But some chemicals, such as endocrine disruptors and pharmaceuticals, are allowed to enter the public waste streams unregulated. And even though some wastes may be hazardous, the Clean Water Act exempts them – including radioactive drill cuttings from fracked gas wells. It’s not just landfills that have to deal with radioactive waste in drill cuttings from Pennsylvania and other states, says Penningroth. Wastewater treatment plants that take landfill leachate have to deal with whatever pollutants end up in the water percolating through the landfills. Add to that the risks associated with train and truck transport of oil and liquefied petroleum gas (LPG) for spills, fires, and explosions and the potential for storage fields - including salt caverns – to leak or explode. Environmental attorney Rachel Treichler has been studying some of the issues that affect the Southern Tier of NY. “At this time Pennsylvania gas drilling wastes are coming into New York landfills,” she said. 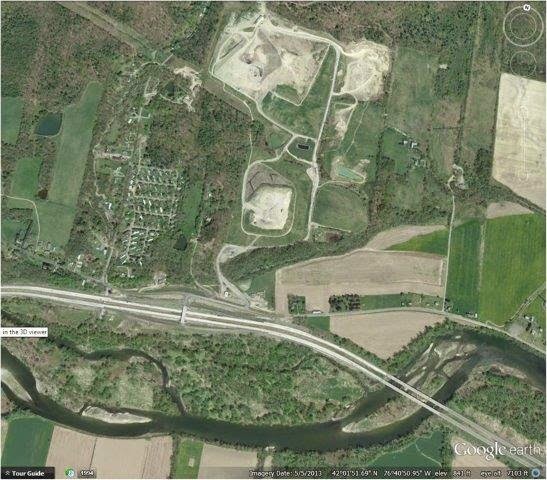 Citing a report from theEnvironmental Advocates of NY, she noted that already 460,000 tons of solid fracking waste and 23,000 barrels of liquid waste from Pennsylvania gas wells – possibly more – have been dumped in a several New York landfills. Three of those, the Chemung County Landfill in Lowman, the Hakes Landfill in Painted Post (Steuben County), and the Hyland Landfill in Angelica (Allegany County) are in the Southern Tier. The Chemung County landfill has taken close to 200,000 tons of drill cuttings. Drill cuttings bring in money for the landfills, said Treichler. But they also bring in radioactive isotopes. 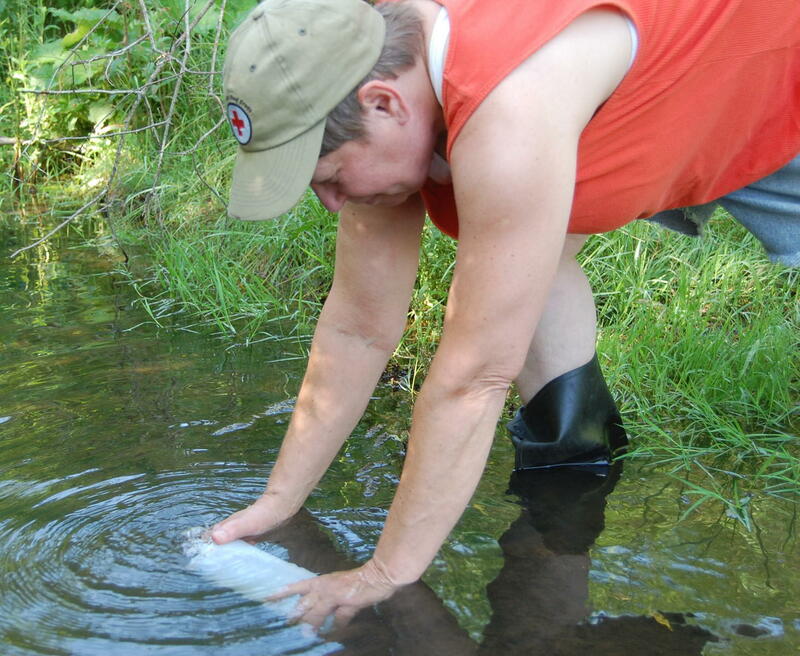 Treichler is concerned that some of the waste contains radioactive flowback from the gas wells. “I’ve watched loads being dumped, and they’re so liquefied that they splash,” she said. That liquid could contain radon and radium, naturally occurring radioactive elements found in Marcellus shale wells. And while the landfill has a radioactivity detector at the entrance, it only detects gamma radiation, not the more common alpha and beta radiation. “The landfills take drill cuttings because they’re not prohibited,” says Treichler, “not because they’re safe.” If drilling waste were treated the same way as low-level radioactive waste, such as that produced by hospitals, it would have to be tracked, she says. There is no tracking of drilling waste. The problem with radioactive elements in waste is that they don’t stay put. Water percolating through the landfill leaches heavy metals and radioactive isotopes. If there are no leaks in the landfill lining, that leachate is collected and transported to wastewater treatment plants. Or it might migrate through the soil to end up in a local waterway. Even if the leachate ends up at the waste treatment plants, those facilities are ill-equipped to treat hazardous and radioactive waste, says Treichler. So that radiation is eventually discharged, along with the treated water, into local rivers. Leachate collected from the Chemung County landfill is sent to the Chemung County waste water treatment plant in Elmira to be treated, after which it is discharged into the Chemung River which flows into the Susquehanna and provides drinking water to communities on its way to Chesapeake Bay. 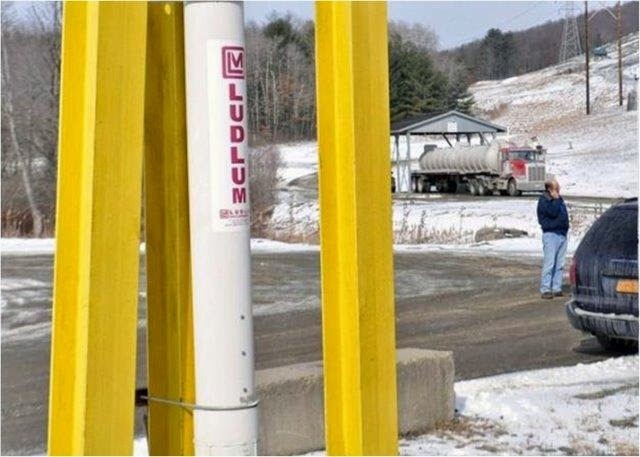 In 2010, Chemung County residents concerned about radioactive drilling waste challenged the landfill’s permit that would allow them to accept drill cuttings. The result: two years of required testing of the leachate. Gary Abraham, an attorney working with the residents, compiled the data from four rounds of sampling. In an email to Tompkins Weekly, he explained that the data show that the leachate is becoming more radioactive, but the levels are well under the discharge limits. Still, Abraham is concerned about the radioactive contaminants, particularly radium-226. It is persistent in the environment and bio-accumulates up the food chain.